Why do cars get bigger? Since the 1920s, most automakers have been committed to frequent redesigns of their wares — every year, at some points — in order to encourage buyers to trade up. With these frequent changeovers comes a challenge: how to justify the superiority of the new model, year after year. Genuine technological innovation is expensive, and while stylists can always make something look different, different isn’t automatically better. Size, however, is something that even the least-erudite buyer can see — and show off to envious neighbors. Adding a few inches here and there is relatively cheap, especially if the extra length is tacked on to the nose or tail, where it doesn’t affect interior volume or packaging. Of course, the extra bulk adds weight, which does nothing good for performance or fuel economy, but bigness its own reward, or so the salesmen will tell you. By the late 1950s, American cars had reached such extremes of size and overwrought decoration that customers began to rebel. Spurred on by a recession that began in late 1957, buyers turned to smaller, more economical alternatives like the AMC Rambler line or imported compacts like the Volkswagen Beetle. Sales of most big cars took a significant hit. Detroit hastily responded with an array of domestic compacts like the Ford Falcon and Plymouth Valiant, many of which proved quite successful. Introducing new products was one thing, but what to do about the existing ones? General Motors did discreetly trim a few inches from many of its 1961 models, whose styling was also far more restrained than before. Nevertheless, even the “low-priced three” (Chevrolet, Ford, and Plymouth) were still decidedly zaftig. Reducing them back to their 1957 dimensions would have made rational sense, but selling that change to a public that had been hammered for years with the bigger=better equation was another matter. Chrysler found this out the hard way in 1962. Back in 1960, then-president Bill Newberg had come to the erroneous conclusion that Chevrolet was going to shrink its big cars for 1962. Fearing that Chrysler would be left behind, Newberg ordered a crash program to downsize the 1962 Dodge and Plymouth lines, accomplished by having them share a stretched and widened version of the compact Valiant‘s body shell. From a practical standpoint, the idea had its virtues — the 1962 Dodge and Plymouth were nearly as roomy as before and significantly lighter, benefiting acceleration and fuel economy — but it was a stylistic disaster. Worse, Chrysler made no effort to publicize the benefits of the downsized models, which left dealers in the difficult position of selling cars that were smaller, uglier, and no less expensive than their principal rivals. Sales were so dire that midway through the model year, Chrysler had to contrive a bigger model for beleaguered Dodge dealers. Needless to say, Chrysler hastily retreated from the downsizing concept, although Dodge and Plymouth did find the silver lining, transforming the Valiant-based 1962 models into a new line of midsize cars. Chrysler’s harsh lesson was not lost on the rest of Detroit, where the size and weight of nearly every model resumed their steady climb for the rest of the decade. William L. Mitchell replaced Harley Earl as head of GM styling in the fall of 1958. While Earl’s tastes had run to lavishly chromed cars that looked as big as they were, the designs produced during the early years of Bill Mitchell’s tenure tended to lean, confident shapes with a comparative minimum of ornamentation. There was perhaps no clearer example of Mitchell’s aesthetic than the early Pontiac Grand Prix, a personal luxury coupe aimed in the general direction of Ford’s popular Thunderbird. The Grand Prix was introduced in 1962 as a successor to the short-lived Pontiac Ventura, offered in 1960 and 1961. The Ventura, available only in stylish two- and four-door hardtop form, rode the shorter wheelbase of the low-line Pontiac Catalina, but it was trimmed like the more-expensive Star Chief and Bonneville. It sold in reasonable numbers, 56,000 in 1960, about 27,000 in 1961. In 1962, it was replaced by the Grand Prix, a conceptually similar model with a new squared-off “formal” roofline. Available only as a two-door hardtop, it was about an inch (25 mm) lower than other B-body Pontiacs and it came standard with bucket seats and a center console, much like the Thunderbird. 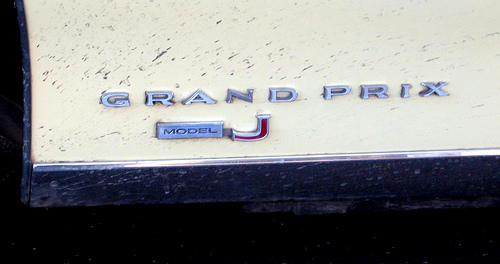 The first Grand Prix sold 30,195 units in 1962. The Pontiac Grand Prix reached its stylistic apogee the following year. The 1963 B-body Pontiacs were all-new and the first models designed entirely under the auspices of Jack Humbert, who had become Pontiac’s chief stylist in March 1959. Humbert was relatively young — he was 34 when he became chief stylist, 38 when the 1963 Pontiacs went on sale — with an appreciation for crisp, neatly detailed shapes. The 1963 Grand Prix was once again a two-door hardtop sharing its body shell and much of its sheet metal with the Catalina, but it added a new roof with a concave rear window, shared with the contemporary Oldsmobile Starfire. In sharp contrast to the usual American custom of the time, the Grand Prix had less chrome than lesser Pontiac models; other than the grille, bumpers, and the ribbing over the taillights, it had little bright trim. Stripped of unnecessary embellishments, its clean basic shape, with sharp lines and a subtle “Coke-bottle” flare to its fenders, did all the talking. By American standards, it was a masterpiece of restraint, both sporty and tasteful. 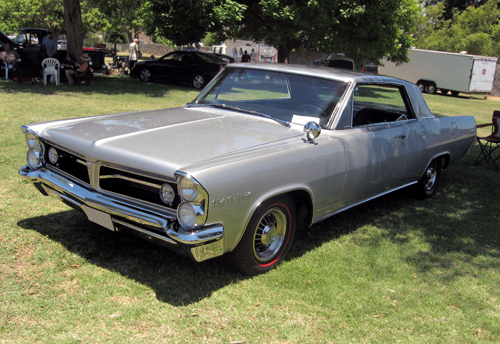 The 1963 Pontiac Grand Prix was available with a choice of five V8 engines: three 389 cu. in. (6,372 cc) and two 421 cu. in. (6,902 cc) engines, ranging in (gross) horsepower from 230 to 376 (172 to 281 kW). Most — including this 421-equipped car — had the optional automatic transmission, the unhappy Type 10 Roto Hydra-Matic three-speed introduced in 1961. Despite a base price some $630 more than a Catalina hardtop, Pontiac sold 72,959 Grand Prixes in 1963, more than double the ’62 volume and almost 10,000 more than the 1963 Ford Thunderbird. The Grand Prix set a stylistic tone for the industry and helped to make Pontiac #3 in the industry for the second year in a row. It was another feather in the caps of general manager Pete Estes and chief engineer John DeLorean, who succeeded Estes as head of the division in July 1965. Although it looks lean, the 1963 Pontiac Grand Prix was by no means a small car. Still sharing the Catalina body (albeit with a unique roofline), it stretched 211.9 inches (5,382 mm) on a 120-inch (3,048mm) wheelbase and weighed around 4,200 lb (1,905 kg). As is customary in the auto industry, the Pontiac Grand Prix kept getting grander. Since it shared the B-body of the bread-and-butter Catalina, as the Catalina grew and gained weight, so did the Grand Prix. By 1967, the latter looked distinctly bloated, like a former athlete gone to seed. The Grand Prix’s appeal had been based on its clean, sporty image, which was rapidly becoming a memory. “It was propped up by some very good advertising and marketing,” recalls former Pontiac ad man Jim Wangers. “It really didn’t have anything else going for it.” Sales fell to around 40,000 units a year in 1966 and 1967 and dropped below 32,000 in 1968. Bill Collins, then assistant chief engineer for chassis engineering, called it a disaster. 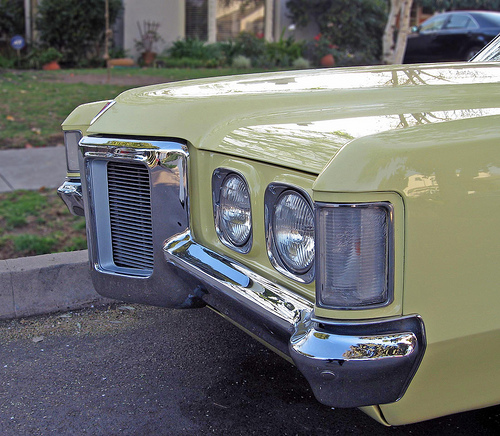 1967-1968 Pontiac Grand Prixes had concealed headlamps, which were starting to become passé in the late sixties. The 1969 Grand Prix reverted to exposed, horizontal quad headlamps, which were more in keeping with the neo-classical motif. Note the distinctive bulge in the hood, which stylists called the “ironing board.” Like the GTO, the Grand Prix could be ordered with Pontiac’s gimmicky hood-mounted tachometer, a pricey option. More conservative buyers could specify the rally instrument cluster (standard on the Model SJ), which included a conventional dash-mounted tach. DeLorean felt that the Grand Prix’s bulk was at the heart of the problem. Although the ballooning size of the B- and C-body cars hadn’t done any particular harm to sales of the Catalina and Bonneville, it was definitely not good for the Grand Prix. In an ideal world, the GP would’ve had its own body, but for the model to be economically viable, it needed to share an existing body shell. Nobody said, however, that it had to be the B-body. 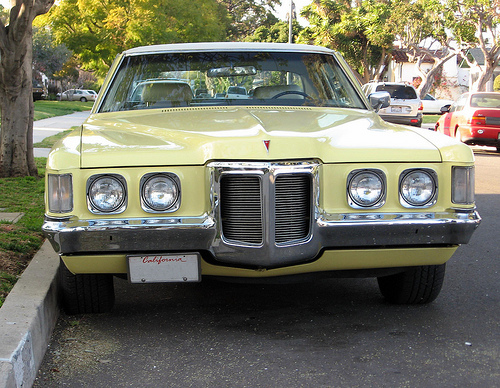 The 1969 Pontiac Grand Prix’ prow-like grille was a theme shared by many 1969 Pontiac models (and, curiously, the 1970-1971 Ford Thunderbird, which was overseen by former Pontiac chief Semon E. “Bunkie” Knudsen). The new beak looked more at home on the Grand Prix than it did the awkward 1969 Firebird. The horizontal grille bars are among the details that mark this as a 1969; the nearly identical 1970s had vertical bars. The solution to the Grand Prix dilemma came from Benjamin W. Harrison, who had established Pontiac’s new Product Planning department in 1966. “He had a real good knowledge and understanding not only [of] what made a car, but [of] the market and why people bought a car,” Jim Wangers recalls. In a memo dated April 17, 1967, Harrison outlined his idea. The essence of sporty-car styling, as epitomized by the Ford Mustang, was a long hood and a short deck. The upcoming 1968 A-body intermediates, including Pontiac’s Tempest/Le Mans/GTO series, were slated to use two wheelbases, 112 inches (2,845 mm) span for two-door models and 116 inches (2,946 mm) for four-doors. Why not, Harrison suggested, create a special long-wheelbase coupe (with a 118-inch (2,997mm) wheelbase, 2 inches (51 mm) longer than the sedan), using the extra length to give it an impressively long hood? Such a car could still use the existing inner-body structure and chassis of the A-body — keeping tooling costs at a manageable level — but it would have a distinctive look, in keeping with the sporty Pontiac image. In essence, Harrison proposed transforming the Grand Prix into a long-nose GTO. DeLorean liked the idea and asked design chief Jack Humbert to develop styling concepts for such a car. Designer Wayne Vieira, later to become chief stylist for Saturn, soon developed a look for the smaller Grand Prix, which the design staff hastily transformed into a full-size clay model. It combined the long-nose, short-deck theme with a dramatic, prow-shaped hood and a unique roofline, with broad sail panels and slightly concave backlight. DeLorean approved it immediately. The problem now was paying for it. Costs were particularly critical because production engineering for the B-body 1969 Grand Prix had already begun and the engineers would have to scrap all that work and start over. While Harrison’s concept used many existing components, it still needed a modified A-body frame and some unique sheet metal. The biggest challenge was the new roof, which was not shared by any other A-body; there wasn’t enough left in Pontiac’s 1969 budget for the additional tooling costs. This is a 1969 Pontiac Grand Prix Model J, the base model, probably with the base 400 cu. in. (6,554 cc) V-8. It had 350 gross horsepower (261 kW) with a single four-barrel carburetor; a two-barrel engine tuned for regular gasoline, rate at 265 gross horsepower (198 kW), was a no-cost option. The Model SJ, which cost $315.96 more, came standard with the 428 cu. in. (7,008 cc) engine, rated at 370 gross horsepower (276 kW). A 390 horsepower (291 kW) H.O. version was optional on both models. While three- and four-speed manual transmissions were available, the vast majority of Grand Prixes had Turbo Hydra-Matic. Rather than give up, DeLorean decided to ask for help from his old boss Pete Estes, who was now the general manager of Chevrolet. In those days, GM’s divisions were far more autonomous — and far more competitive — than they later became. If one division developed a new feature or concept, the other divisions often knew little about it until production began. However, DeLorean knew Estes very well and they were of a similar mindset. Although Estes’ predecessor, Semon “Bunkie” Knudsen, had previously rejected the idea of a sporty “personal” Chevy, Estes was now contemplating offering such a car, which would finally give Chevrolet dealers an answer to the popular Thunderbird. With that in mind, Estes agreed to share the tooling costs for Pontiac’s new roof, which Chevrolet would also use on its own personal car (which became the Chevrolet Monte Carlo) starting in 1970. With the support of Estes and executives from Fisher Body Division, DeLorean received approval from the Engineering Policy Committee to introduce the revamped Grand Prix (dubbed the “G-car” to distinguish it from the other A-bodies) for the 1969 model year. 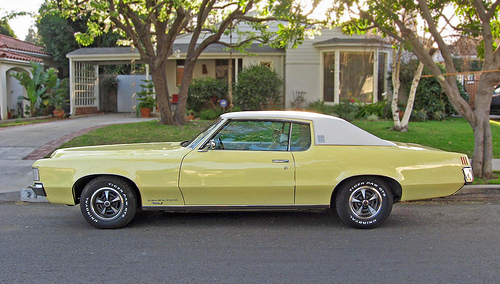 The 1969 Pontiac Grand Prix was 6 inches (152 mm) shorter than before, but 9.5 inches (241 mm) longer than the GTO on a 118-inch (2,997mm) wheelbase. The long nose may have contributed to the disconcerting rocking-horse motions to which the Grand Prix was prone on bumpy pavement, something the optional heavy-duty suspension didn’t entirely quell. This car has the Rally II styled steel wheels, which were an $84.26 option. In Patrick Wright’s 1980 book On a Clear Day You Can See General Motors, John DeLorean asserted that the 1969 Grand Prix was only one facet of a larger proposal to move all of Pontiac’s B-body cars to a stretched version of the A-body platform. He claimed that Pontiac had demonstrated prototypes of downsized big cars — based on a stretched intermediate chassis — to generally good response, but that senior management had been unwilling to commit to anything beyond the Grand Prix. We’ve so far found no evidence to support DeLorean’s claim that he proposed a more sweeping downsizing than just the 1969 Grand Prix, although when he wrote that account, we assume he was well aware that GM was preparing to downsize the B-bodies and A-bodies for the 1977 and 1978 model years; in 1974, he hired that project’s director, Bill Collins, to develop DeLorean’s own sports car, the DMC-12. In any event, even if DeLorean had made such a proposal, Chrysler’s dismal experience with the same basic idea only a few years earlier would probably have made the GM brass understandably wary, at least until the OPEC embargo and a changing marketplace forced their hand. The model year usually begins in the fall of the previous calendar year, which for the 1969 models meant September or October of 1968. DeLorean and Pontiac chief engineer Steve Malone had to scramble to get the new car ready in time. The G-car rode a stretched, “A-Special” version of the Pontiac A-body chassis, 2 inches (51 mm) longer than the standard sedan frame. To create the Grand Prix’s exaggerated proportions, the wheelbase’s extra length was added forward of the firewall. The couple (distance from the driver’s hip joint to the rear axle) was the same as the A-body coupe and the engine was set well back under the mammoth hood, allowing the Grand Prix to retain the standard A-body driveshaft. Like its forebears, the Grand Prix was relatively lean on chrome, but it was far from understated, with voluptuous curves terminating in sharp peaks. Car and Driver compared the results to the Cadillac Eldorado, but Humbert and Vieira’s stated design goal was to evoke the multicylinder gran routiers of the 1930s. Pontiac played up those classical associations with the Grand Prix’s model names: Model J and Model SJ, borrowed from the prewar Duesenberg. The mammoth hood hid mostly empty space — Pontiac V8 engines were wide, not long, and the need to share standard drivetrain components meant the engine sat well back — but it set an appropriate tone. The same was true of Pontiac’s advertising boast that the Grand Prix had a “cockpit-style” interior. In practice, this meant heater and radio controls angled toward the drive, since aircraft-style full instrumentation was an extra-cost option, but passenger space in the heavily padded cabin was indeed cockpit-like. Big American cars had never been noted for their packaging efficiency, but the Grand Prix’s space utilization was particularly egregious, offering less room than the cheaper Tempest/Le Mans/GTO. As usual for the personal luxury genre, it was all about style over substance. The body may have been downsized, but the 1969 Pontiac Grand Prix’s price most assuredly was not. 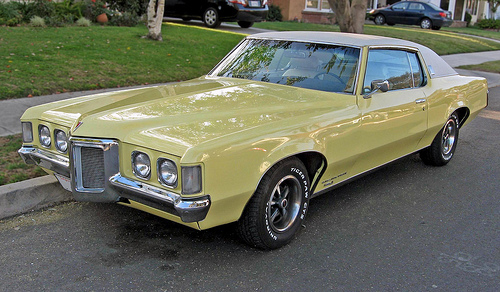 At $3,866 to start, it was $169 more than the ’68 and a whopping $710 more than a ’69 GTO. Furthermore, that price didn’t include automatic transmission ($227.04), power steering ($115.85), radio ($248.56 for stereo AM/FM), or the much-needed front disc brakes ($71.62). The padded vinyl top on this car cost $142.18, and air conditioning tacked on another $421.28. A fully loaded car ran around $5,500 — as much as a well-equipped full-size Buick, but still a lot cheaper than the typical Thunderbird. 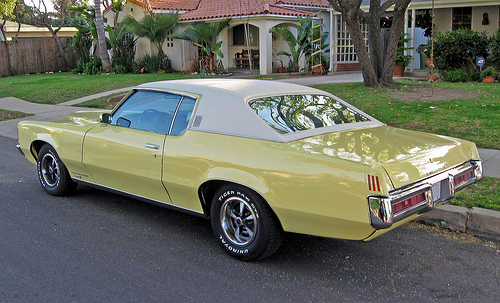 If the 1969 Pontiac Grand Prix wasn’t any roomier than its B-body predecessor, it was at least usefully lighter. The Grand Prix was heavier than a two-door Tempest or GTO, but around 400 pounds (181 kg) trimmer than the Catalina-based 1968 Grand Prix. Furthermore, any of the multitudes of engine and suspension tweaks available for the GTO would work just as well on its bigger brother. The Grand Prix also had a potential edge, since it could be ordered with Pontiac’s biggest 428 cu. in. (7,008 cc) engine, whereas 1969 GTOs were limited to the 400 cu. in. (6,554 cc) version. Even base-engine GPs with automatic could manage 0-60 mph in 8 seconds or less and the quarter in the low 15s. However, the G-body’s reduced weight did not noticeably improve gas mileage, which averaged about 12 mpg (19.6 L/100 km) in gentle driving, and could dip well into the single digits (over 24 L/100 km) in aggressive driving. The GP was also a little less nimble than the GTO — itself hardly sports car agile — and its brakes were only adequate. Whatever its mechanical virtues and limitations, the new Pontiac Grand Prix was an astute exercise in brand building. Far sportier than its oversize predecessor, it was the most aggressive American personal luxury car since the 1965 Buick Riviera Gran Sport. A casual observer would be hard pressed to recognize the Grand Prix’s structural kinship to the A-body cars, but it definitely looked like a Pontiac. The Grand Prix was a car to which former GTO owners could aspire and it appealed to the same sort of affluent sports who today buy BMW coupes. “It really was the perfectly imaged Pontiac,” says Jim Wangers. A cynic might say that the 1969 Grand Prix succeeded because it abandoned any past pretense of good taste. The early Grand Prixes were brash, but by American standards, they were extremely understated. The Oldsmobile Starfire, Pontiac Grand Prix, and Buick Riviera suggest that Bill Mitchell and his designers presumed that affluent buyers would respond to strong, simple lines and restrained trim. What they seemed reluctant to grasp was that Thunderbird buyers loved the T-bird’s shameless gimmickry. They weren’t looking for restraint; they wanted visual drama and gimmicks that would dazzle their friends at the country club. The 1969 Grand Prix’s mix of contemporary Supercar and neo-classicist styling cues was dramatic almost to the point of vulgarity, but it finally gave that audience what it wanted. Sales for 1969 were over 112,000 — more than three times the previous year’s dismal figures and enough to outsell the Thunderbird by more than two to one. By 1970, there was also new competition. 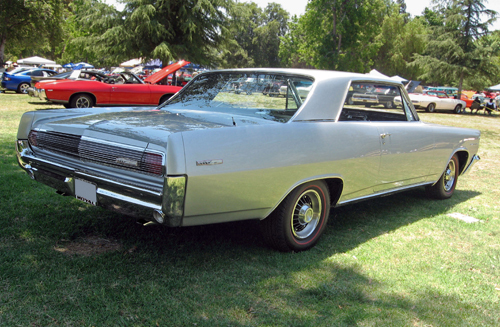 A year after the debut of the new Grand Prix, Chevrolet introduced its own G-car, the Chevelle-based Monte Carlo, sharing the Grand Prix’s long-wheelbase, long-hood proportions and the roofline Chevrolet had helped to finance. Since the Monte Carlo was significantly cheaper than the Grand Prix, it probably stole a fair number of Grand Prix customers. So did Oldsmobile’s revamped Cutlass Supreme, which proved very popular despite retaining the standard coupe wheelbase and proportions. In early 1969, about eight months before the Monte Carlo went on sale, John DeLorean replaced Pete Estes as general manager of Chevrolet. At Chevrolet, DeLorean shepherded the development of the second-generation Monte Carlo, which bowed for 1973. The new Monte continued the same themes as the Grand Prix, but it was even more baroque, with swooping front fenders whose curves carried into the doors like GM’s prewar “torpedo-body” cars. The enthusiast press was generally bewildered, if not appalled, but the new Monte was a smash hit, one of Chevrolet’s biggest successes of the seventies. 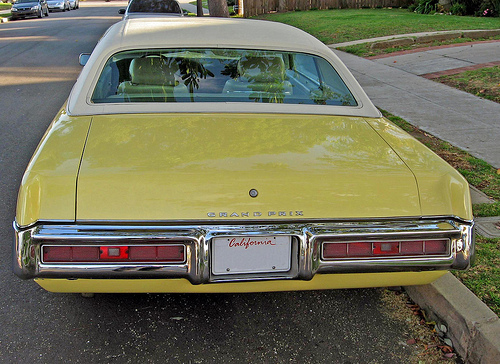 The 1969 Pontiac Grand Prix’s basic design survived with only modest changes through 1972. Its successor was even more popular, although it still didn’t match the success of its Chevrolet rival. Nevertheless, the Grand Prix did good business throughout the doldrums of the mid-seventies. Since it had relatively modest tooling costs and a rather hefty price, it was one of Pontiac’s most profitable cars, consistently earning around $1,500 per car, two and a half times what the division made on its other A-body intermediates. Downsized again for 1978, the Grand Prix became far more anonymous, and sales eroded. In 1988, Pontiac applied the name to its new front-wheel-drive W-body model, which from 1990 on included a four-door sedan as well as the familiar coupe. By the time the Grand Prix was replaced by the G8 in 2007, it had become a generic big sedan, no longer a personal-luxury car and no longer particularly special. Why did the Pontiac Grand Prix’s downsizing succeed commercially while Chrysler’s smaller 1962 cars flopped? Probably because Pontiac wisely didn’t try to sell the Grand Prix based on size (or lack thereof). While DeLorean, Harrison, and other Pontiac execs definitely wanted to make the Grand Prix smaller, the G-car was sold as an extravagantly styled personal car, a flagship for Pontiac’s carefully cultivated rakish image. The fact that it happened to be smaller and lighter was, from a marketing standpoint, incidental. Buyers enticed by the look and the attitude didn’t spend a lot of time comparing dimensions. The moral of the story is that buyers don’t like feeling like they’re getting less of anything, even if it would make financial or environmental sense. If you want to sell smaller, more efficient cars, it’s important to focus on what buyers are getting, rather than what they’re giving up. Our sources for this article included C. Edson Armi, The Art of American Car Design: The Profession and Personalities (University Park, PA: Pennsylvania State University Press, 1988); the Auto Editors of Consumer Guide, “1969-1972 Pontiac Grand Prix,” HowStuffWorks.com, 7 September 2007, auto.howstuffworks. com/ 1969-1972-pontiac-grand-prix1.htm, accessed 4 June 2008, and Encyclopedia of American Cars: Over 65 Years of Automotive History (Lincolnwood, IL: Publications International, 1996); Arch Brown, “Less Is More: 1963 Pontiac Grand Prix,” Special Interest Autos #84 (November-December 1984), reprinted in The Hemmings Motor News Book of Pontiacs: driveReports from Hemmings Special Interest Autos magazine, ed. R.M. Clarke (Bennington, VT: Hemmings Motor News, 2001), pp. 96-103; John Gunnell, ed., Standard Catalog of American Cars 1946-1975, rev. 4th ed. (Iola, WI: Krause Publications, 2002); Dave Holls and Michael Lamm, A Century of Automotive Style: 100 Years of American Car Design (Stockton, CA: Lamm-Morada Publishing Co. Inc., 1997); Don Keefe, “Grand Performance: Pontiac’s luxurious muscle car: the 1964 Grand Prix,” Special Interest Autos #195 (June 2003), pp. 24–31; “Luxury and Performance: The Legendary Pontiac Grand Prix, Part 1 – 1962-1966,” High Performance Pontiac June 1990, “Luxury and Performance, Part 2: Homing in on a changing market — 1967-72,” High Performance Pontiac August 1990, and “Luxury and Performance, Part 3: From 1973 to the present — and then some,” High Performance Pontiac October 1990; Jan P. Norbye and Jim Dunne, Pontiac 1946-1978: The Classic Postwar Years (Osceola, WI: Motorbooks International, 1979); Richard Rauch, Rich’s Classic Pontiac Server, 1997–2001, www.pontiacserver. com, accessed 4 June 2008; J. Patrick Wright, On a Clear Day You Can See General Motors: John Z. DeLorean’s Look Inside the Automotive Giant (Chicago, IL: Avon Books, 1980); and the author’s telephone conversation with former Pontiac advertising executive Jim Wangers on September 18, 2009, which was the source of Wangers’ remarks herein. We also consulted Julian G. Schmidt, “Shakedown in Michigan,” Motor Trend Vol. 20, No. 9 (September 1968), pp. 37-41, Bill Sanders, “Luxury with a Flair: Thunderbird, Marauder X-100, Riviera, Grand Prix, Toronado,” Motor Trend Vol. 21, No. 2 (February 1969), pp. 74-85; and “Two Pontiac Grand Prix,” Car and Driver Vol. 14, No. 6 (February 1969), pp. 31-34, 82-83. FROM A DIE HARD PONTIAC ENTHUSES , NO HONORABLE MENTION OF THE REVAMP 71/72 GRAND PRIX I THINK YOU SHOULD OF FINISHED YOUR ARTICLE FOR A FEW MORE YEARS DONT YOU THINK. GREAT RESTYLING THAT YOU LEFT IN THE GARAGE. Nice write up, I enjoyed the read. You made note how the tail lamps were integrated into the bumper like the ‘69 GTO. I think you meant the ‘68 GTO since in ‘69 they were moved back above the bumper like the original concept design by Bill Porter. That’s an excellent point. I had always parsed the ’69 GTO taillights as integrated into the bumper, but you’re right: The bumper is recessed around them, but they’re actually set above it. I amended the text, because the ’68 GTO is a better point of comparison in that regard.